This cemetery has an attractive iron and brick fence along the road. The entire cemetery is fenced. It has businesses to the south and north and houses on the west. 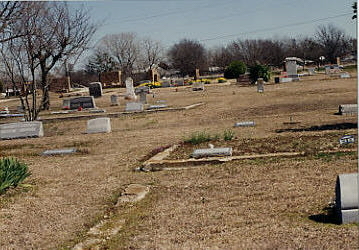 The cemetery covers about 4 acres of land. It was an IOOF cemetery, which is the Independent Order of Odd Fellows. 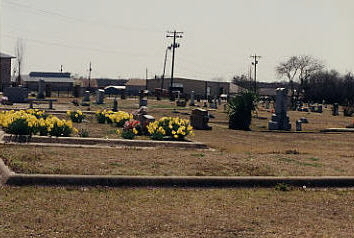 Other IOOF cemeteries in Collin County are Allen, Blue Ridge, Farmersville, and Nevada. There is a deed listed in Vol 67, p 326, for 3 acres. Page 325 shows a plat map of the cemetery. This cemetery is well maintained and active. This area was once known as Long Neck. The IOOF met in the second story of the building that was next to the cemetery. The elementary school was on the ground floor. The second floor was actually for the Woodmen of the World, but the Odd Fellows shared the floor. There is a cotton gin just north of the cemetery. The community of Princeton got its name when the railroad went through the area. It was originally named Wilson's Switch after two Wilson brothers who lived in the area. The US Post Office rejected that name because there was already a community named Wilson. The town was named Princeton after Prince Dowlen, who was another land owner in the area. There was a POW camp here in World War II. The German prisoners were used to construct parks and athletic fields. There is a historical marker for the camp.